The Women as Global Leaders Conference (WAGL 2012) celebrated the courage and creativity of socially responsible leaders and their capacity to leave a lasting legacy, impacting the sustainable future development of communities and organizations across the world. The conference presented a unique dialogue and exchange of ideas with some of the most prominent women leaders in the world today. Held in Abu Dhabi (from March 13-15), the conference theme, “Creating a Sustainable Future for the World,” aimed to advance women’s leadership. As part of the diverse lineup of speakers, I participated in a panel presentation titled “Facets of Emirati Women” with Peter Hassall, Fatma Al-Hashemi, Omnia Amin, Roudha Al-Sabousi, Ken Collins, Yuko Takeshita and Fujimi Sakae Tanaka. 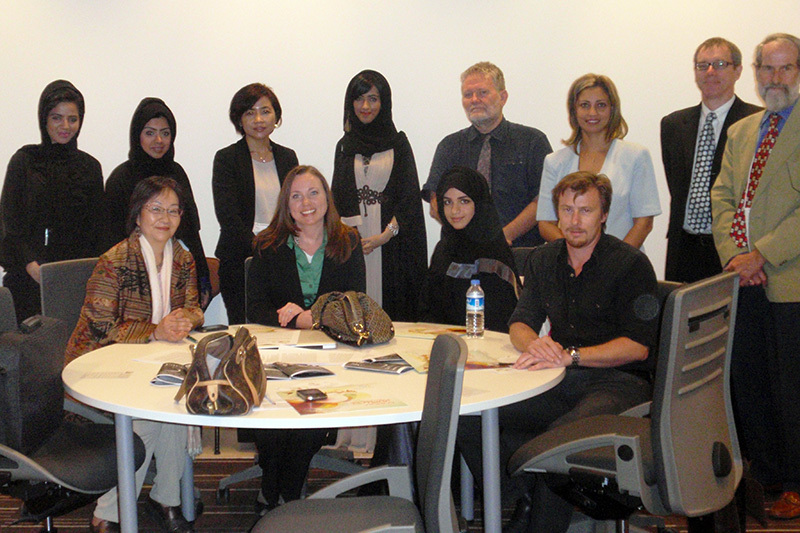 Following this panel presentation, I was invited to present “Facets of Emirati Women” at the Hult International Business School with Peter Hassall and Fatma Al-Hashemi (May 19) and at the Shelter Gallery with Peter Hassall, Omnia Amin, Mary Jane Curry and Naomi Matsubara (April 7).